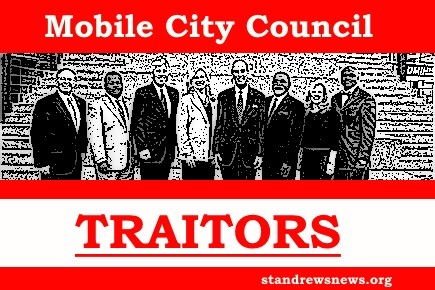 The Mobile City Council voted Tuesday to remove the Confederate flag and other banners from the official seal of city government following complaints that the Old South symbol depicted racism and intolerance. The 6-0 vote, from which one member abstained, means only the U.S. flag will remain on the seal of the port city. A version of the Confederate national flag and four other historic flags will be taken off. As the above article relates, only the United States flag will remain on the City of Semme’s seal. This is very telling, showing that these traitors have little interest in preserving Alabama’s Little Rome from the scourges of U.S. Imperialism. The message: we are not Southerners, but “Americans.” While the self-described “progressive” council seeks to be seen as inclusive, it becomes intolerant of the very thing that made it great. It is important not to become discouraged by the actions of high-handed individuals like these. While they seek to eradicate us from existence, we should realise that this decision resulted from a vote of seven persons in a city of 200,000 souls- hardly representative. Next Go Set a Watchman: A Novel for Southern Nationalists?